Author and publisher K. David Brody was born in London, UK. His grandparents immigrated to London from Rypin, Poland early in the 20th century and his parents were practicing Orthodox Jews. He graduated from Edinburgh University, Scotland, subsequently moving to Montreal, Canada. He worked initially at Societé Radio-Canada, the French division of CBC, then moved to Jerusalem for two years in the 1980s. Although that experience was enriching from several points of view, it was there that he first felt truly Canadian. On returning to Montreal, he worked as a freelance translator from French to English. He continues to be an Orthodox Jew and participates actively in the Jewish community. Mourning and Celebration is his first novel. From time to time, author K. David Brody accepts public speaking invitations at synagogues, universities, and other public forums. If you would like David to speak at your function, please contact us. Have you ever wondered how life would have been, had you been born one hundred years earlier? 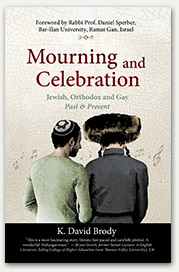 Mourning and Celebration is how author K. David Brody answers that question. Yankl lives in a 19th-century Polish shtetl. And he's gay. Within the framework of conversations with his alter ego who lives in a 19th-century Polish shtetl, the narrator learns how a gay, Orthodox Jew like himself managed to emerge from the social pressures of his community. Yankl is a brilliant scholar, a talented violinist, an only son and gay. Although blessed with social skills, he feels isolated as a young teenager. Subsequently, we follow his development through intense relationships with his family, rabbis and lovers. This is a story of a personal search for validation and human rights, in a context where that concept was not yet understood. 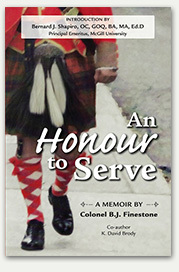 An Honour to Serve recounts the life and times of Col. B.J. Finestone, an essential Montrealer, Quebecer and Canadian, from his childhood in the 1930s to the end of his life in 2013. He was both a witness and an active participant in a variety of contemporary events: World War II, the history of Montreal, the evolution of the insurance industry, the development of the Port of Montreal, the politics of his time and Montreal’s Jewish community, among others. He was on familiar terms with some of the greatest political and social actors in Canadian history, and his fascinating life story is told in his own personal style in his memoir, An Honour to Serve. © 2018 by Transcréation and K. David Brody. All Rights Reserved.